This collection equips you to design higher quality and more sustainable buildings. Build your capability to deliver great design. 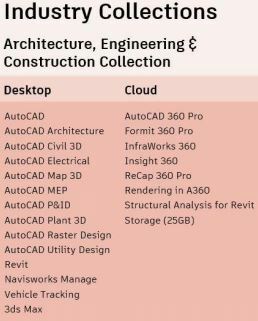 Driving better outcomes Get more for your money Take advantage of significant cost savings when purchasing multiple Autodesk software solutions as part of a collection. Support your business today and into the future Stay ahead of changing business needs with access to a wide selection of the most essential Autodesk software used in your industry — while enjoying a steady stream of new releases and product enhancements for improved workflows. Manage operational costs more effectively Reduce operational costs (IT and procurement spend) by standardizing on a collection of technology flexible enough to suit the needs of a majority of your users. Optimize IT spend Take advantage of significant cost savings when purchasing multiple Autodesk software solutions as part of a collection – giving your users access to more technology while reducing IT costs.